Peter Parker’s character really glamorizes the casual spider bite. He takes one class fieldtrip to a science exhibit and a radioactive spider sinks its teeth into his skin, subsequently giving him super-human powers that resemble an arachnid’s and allows him to assume the role as the crime fighting “Spiderman.” He then goes on to heroically save his city from evildoers and evolves into a beacon of hope for a city constantly filled with people like a scientist-turned-mechanical octopus or a crazed hobgoblin. Meanwhile, those who’ve had the unfortunate experience of a non-fictional spider bite fondly remember the week-long welt. Most of you shudder at the thought of a spider that could be dangerous, let alone seeing one scurry into your home. So today, we detail a few spiders you may see in the Houston area and some key facts to *hopefully* help settle your fears. Asposematism, or warning coloration, is an evolutionary trait that plants and animals gained over time to signal a particularly dangerous characteristic they may have: a poison dart frog’s red skin, a skunk’s black and white pattern, a coral snake’s vibrant pattern. 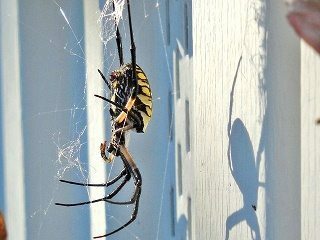 Humans have come to view insects with color as dangerous, so when we see a garden spider’s yellow coloration on the abdomen, we might assume it’s venomous. This is hardly the case, however, as the garden spider is an entirely non-venomous creature. It received the name due to its propensity for sunlight and spinning webs on the foliage, so you may find more than a few in your own garden. But don’t be alarmed, this spider variety will only trap the flying insects around your yard and do you a great service in the summer months. Contrary to popular belief, not all spiders produce webs. 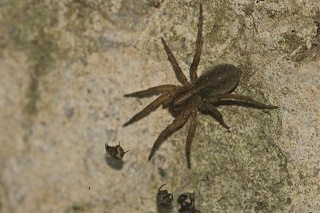 Most people assume that arachnids produce a web hoping to catch flies and gnats, but the wolf spider does no such thing. Instead, they protect themselves from predators by burrowing deep into the ground and using a silk filament to shield the entrance. This means they usually will not enter your home until the colder months, but they have learned to assimilate among humans. 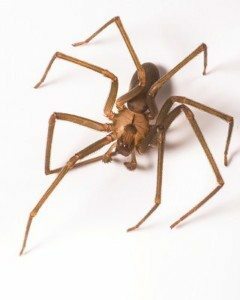 You may mistake their exterior as that of a Brown Recluse, but, as we discuss later, the latter is often mistakenly recognized for a number of different species. The wolf spider is no harm to you and will only bite should one provoke it. Many spiders have the nickname of the “house spider,” because it’s an all-encompassing term used to characterize those spiders entering a home. The particular species we’re discussing now is the Parasteatoda tepidariorum, or the common house spider. These are the pesky arachnids spinning cobwebs in your attic or along the bannister on your outdoor deck. While certainly not a threat to your health, the cobwebs they produce can sometimes be a nuisance. Exclusion is the best prevention method, which includes filling entry-points in your attic or basement with caulk and vacuuming the webs to remove the actual spider along with its eggs. The black widow’s moniker derives from the misconception that females devour their male counterparts shortly after mating. While untrue, this certainly doesn’t help the black widow’s mystique as a cold-blooded killer (Black Widow in the Marvel universe was a superhero, ironically enough). Let’s dispel a few notions. Yes, the black widow contains venom that can affect your central nervous system, which demands immediate medical attention. Does the black widow roam the Earth looking to kill humans? No. 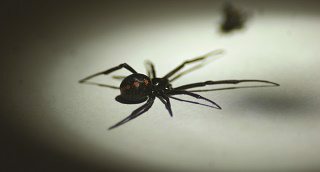 Of 2,000 people bitten by a black widow last year, not a single person died. Additionally, black widows mainly keep to themselves and will only bite should a person disrupt their habitat or appear to threaten the spider’s eggs. Black widows possess the classic “red hour glass” indicator on their abdomen, signaling to other creatures their venomous nature. This is clearly visible during their web creation, as they suspend upside down to reveal their abdomen. Black widows mainly take shelter in dark, secluded areas. Always be careful when shifting logs in your outdoor woodpile or when shifting items in your basement. Always consult a professional about removing a black widow. The classic identifier of the Brown Recluse is the “violin” shape on its cephalothorax, or the area where the legs are attached. 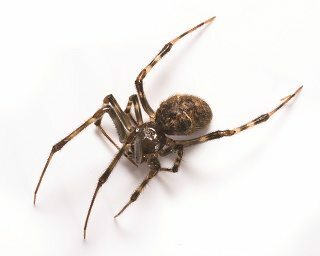 Its curvature very much resembles the classical instrument, yet brown recluses are often the most misidentified spider species. Indeed, most studies find them to be “widely over reported,” which probably stems from a nationwide fear of any brown spider entering the home. Much like the black widow, the brown recluse prefers secluded hiding locations, and their bite contains venom harmful to humans. Their bite is painless, with most victims not even realizing it happening. The result can turn into a small papule, which is a raised portion of the skin. Again, seek out medical professionals if you happen to come into contact with a brown recluse. If you’re sharing your living quarters with spiders, contact Holder’s Pest Solution for managing these pests.